Dreaming of snowball fights, Christmas markets and roasting marshmallows by a fire? Your ultimate winter fairytale is out there and it’s easier to reach than you think. Indulge in a private jet or private helicopter and travel in luxury to some of the world’s most beautiful locations. Here’s our list of Bespoke Air Charter‘s favourite winter holiday destinations to get you planning. Located between the Arctic and Atlantic Oceans, Greenland is an underrated destination with huge potential. In winter, the Northern Lights can be seen across the country, and with a vast amount of mountains and skiing locations, Greenland is a great escape for those after snow and adventure. Flight time is approximately 5½ hours and temperatures average around -3℃, so be sure to wrap up in thermals. Hotel Arctic, located in Ilulissat, is a 4 star hotel with themed rooms and even igloo experiences. Close to local amenities, Hotel Arctic includes an onsite Nordic restaurant and has amazing views icebergs and the snow landscape. The hotel is also near the Ilulissat Icefjord, a tidal fjord covered in ice and one of the few places where ice from the ice cap enters the sea. A must see is the Northern Lights, or Aurora Borealis. The unforgettable experience will be a regular occurrence in the winter months and is best seen at midnight in a clear, dark sky. Greenland is one of the the best places on earth to see the lights, visible from most parts of the country, including the South. The south of Greenland is also home to hot springs. The naturally heated pools on the island of Uunartoq are the only ones that are warm enough to bathe in though. Relaxing for the body and soul, the springs are surrounded by mountains and drifting icebergs, with the water being warmer than the surroundings. Bespoke Air Charter recommends: Whale Watching. Famed for whale-spotting, Greenland’s waters are the permanent home of beluga whales and narwhals, along with the occasional visit from blue whales and even killer whales, making it an ideal location for whale spotters. A stone’s throw away from England but different in so many ways, Berlin is a hub for theatre and culture. With Christmas approaching and the added night-time bonus of fairytale ballet performances and modern dance evenings, winter in Germany’s capital is a sight to behold (even though it averages a chilly temperature of 2.8℃). Located in Berlin City West, Waldorf Astoria is near the luxury shopping district and is in walking distance of landmarks and local transport links. Every room has a panoramic view over Berlin and combines Art Deco design with modernity throughout the hotel’s interior. A cosy hotel to return to after a day of sightseeing. As winter approaches, so does Christmas, and Berlin’s Christmas markets are perfect for locating unique presents for friends and family. Berlin has almost 80 markets around the city, each offering a different selection and marketing stalls. Along with a wide selection of shops and restaurants, Berlin is also home to Alpine Berlin, a former tower bunker standing at 18.7 metres. It now serves as a year round climbing wall, which becomes an icy climbing wall if temperatures stay below -4℃. Once climbers reach the top, they are gifted with views of the wintry Berlin landscape. 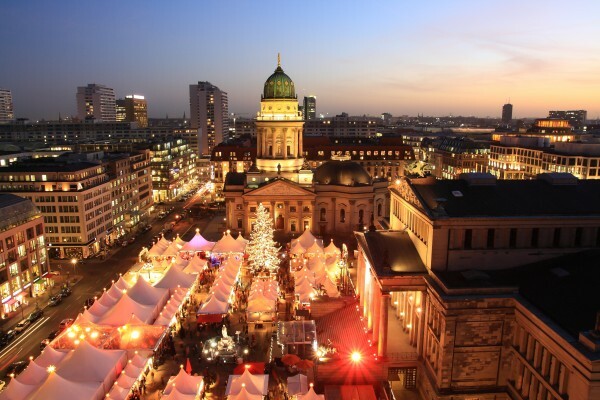 Bespoke Air Charter recommends: Berlinale. Berlinale is an annual film festival and is a great chance to see all kinds of premieres and possibly meet some of the industry’s finest. Next year’s Berlinale takes place in February 2016, with further details to be released. A known celebrity hotspot and a favourite among skiers, Aspen’s snowy slopes and family friendly atmosphere has earnt itself a highly regarded reputation. During winter skiing months, temperatures are expected to stay around 2℃ to -12℃, making it ideal for skiing and snowboarding. Aspen encompasses four mountains, with Aspen Snowmass offering the largest vertical descent in North America. From the UK, the long flight time (15 hours) is vastly improved by flying privately and in luxury, though the slopes definitely make up for the travel time. Situated at the foot of the Aspen Mountain, The Hotel Jerome offers the best of luxury in an authentic mountain setting. Close to town, the hotel has all the amenities required, including spa and cocktail bar, with easy access to the mountain and ski resort. It is also pet-friendly and offers a seasonal concierge and valet service to guests. Along with skiing, Aspen offers tubing facilities, wherein you can soar down the slope in a inflatable ring. Tubing lanes are also available to hire out to large parties, great for a group activity. Continuing on with the thrills are Aspen Powder Tours, which allows guests to experience untracked glades away from the crowds, guaranteeing fresh tracks and gourmet lunch. Bespoke Air Charter recommends: Ullr Nights. Hosted every Friday of the winter season on Mount Snowmass, the evening is dedicated to Norse God of Snow, Ullr, and is a family fun evening of tubing, bonfires, ice skating and music. The Ullr Night snowbike tours are a particular highlight, offering the chance to explore the mountain trails at night.